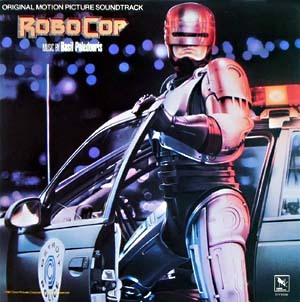 Varese Sarabande release of Basil Poledouris’ original score to the 1987 sci-fi actioner Robocop. This is brand new and sealed copy of the original 1987 USA 12″ 33rpm pressing! The late Basil Poledouris’s score to Paul Verhoeven’s 1987 Robocop is dark in tone and filled with a mixture of fast orchestral action and quiet, lamenting emotional themes. Like many of Poledouris’ scores, this is a soundtrack that has lasted the test of time and can be listened to now as easily as it was more than two decades ago when it was composed. It is a score that works beautifully in the movie and as a stand alone album.